The sensuous siren call of King Roger’s wife is one of the opera’s most intoxicating moments. Her voice, distant and unseen, comes out of nothing. Roxana sings offstage, a sweet, high, held note that slides yearningly down an unfamiliar, exotic scale. From its first siren call, Roxana’s Song, from Act II of Karol Szymanowski’s opera Król Roger, intoxicates with its beauty. 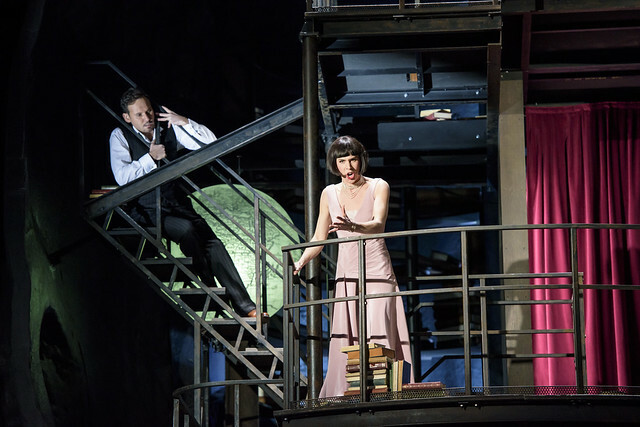 Roxana’s Song is probably the opera’s best-known music. In the same year the full score was published, in 1926, the publishers released a stand-alone version of the Song for soprano and orchestra. A few years later Szymanowski’s close friend, the violinist Paweł Kochański, released a new version for violin and piano. In this and in a variety of other orchestrations the Song exists in numerous recordings. It is not just the beauty of Roxana’s Song that has made it so attractive for performers and audiences. It is one of the opera’s several set pieces, sections that structurally stand apart from the opera’s through-composed flow – the other in Act II is the orgiastic Shepherd’s Dance that follows Roxana’s Song. The Song is the shortest of these set pieces, only four minutes in length. And it is also probably the simplest – a hushed lullaby, with an exquisite stillness that differentiates it from the predominant opulence of the opera’s scoring. Each of the three acts of Król Roger centres around a conflict between the King and the Shepherd, a mysterious prophet who has come among Roger’s people. Each conflict is preceded by an interjection from Roger’s queen, Roxana. In the first act – the ‘Byzantine’ – her voice sounds amid the people’s cries for the Shepherd’s execution, as she begs the king to listen first to the Shepherd’s message. In the second – the ‘Oriental’ – she pleads for clemency once again in her Song, but now her voice comes from afar, as she heralds the arrival of the Shepherd and his Bacchic following. The Song’s uninhibited sensuality presages the events of the final act – the ‘Hellenic’ – when she will leave Roger to follow the Shepherd. Roxana’s Song interrupts Roger and his advisor Edrisi as they talk of the Shepherd; Roger fears the ‘strange fire that burns in his eyes’. Distant tambourines are heard ‘by the gates of the slumbering city – he is here’. They and the orchestra fall silent, listening. Roxana’s voice soars out of the darkness in a wordless melisma. The downward scale that follows her long held note is constructed out of minor 3rds and semitones, true to the act’s ‘Oriental’ (Arabic-Persian) colour. Her melisma continues into a second section, a small fragment that rises and falls, graced with a tiny, fleeting ornament, with imitating woodwind instruments that entwine with her voice. This second melismatic fragment leads into the next section, the main body of the Song. Roxana sings a simple melody in a gentle lilting three-time, with hypnotic accompaniment from piano and strings. The music is now less obviously ‘Oriental’, but there is still something exotic and other-worldly in its trance-like stillness. She uses words for the first time in the Song – ‘Banish King Roger’s blood-stained dreams’ – and the female chorus rises beneath her as the simple melody grows in intensity. The verse returns two more times, each time following a different combination of the melismatic fragments and brief interjections from Roger and Edrisi, as they marvel at the beauty of her singing. There is an easy inevitability about the return of each verse, but also a deepening intensity as Roxana urges her husband to ‘Be like a weary panther, gorged on blood’. After three verses, the second melisma returns, repeated again and again, rising higher and higher, louder and louder, violins and woodwinds writhing with Roxana’s voice. Finally we realize that there is a dangerous energy behind the music’s seductive beauty – a herald of the immolation to come in Act III. Król Roger runs 1–19 May 2015. Tickets are still available. I am daily amazed by the 'new' music. I am daily amazed by new music.